Los Angeles needs green power. Does it have to tear up the desert to get it? One hundred and fifty miles east of the city of Los Angeles, the Mojave and Colorado deserts converge in towering granite rock formations and strange succulent plants -- Joshua trees raising their arms to heaven like ancient prophets. From Interstate 10, everything looks brown and barren, but oases of spring-fed green hide a little ways in, with just enough water to sustain several hundred species of birds, lizards, bugs, bobcats, desert tortoise and a ragged herd of peninsular bighorn sheep. Austin Puglisi had planned to build his dream home here. Not your typical desert dream home, the one with the high fence to protect it from wind and the irrigated lawn to mimic the lush Midwest. Puglisi wanted to build a tiny shack and set the rest of his 54-acre parcel aside for wildlife. He would use only local water and recycle it into the aquifer. He would get off the grid and live far from its influence. So it came as a shock, one day last winter, when Puglisi discovered that the grid was coming to him. On federal land just a few yards from the boundary of his property, Puglisi spotted a bright orange stake marking the spot where a metal disk had been anchored in the ground with concrete. Engraved on the disk were the words, "Los Angeles Department of Water and Power." "From what I could tell," says the 47-year-old Puglisi, "it looked like some kind of utility project was either going right through my land or on the ridge right above it." Puglisi was flabbergasted. "We had just secured our building permit," he says. "We had put in our solar-powered well. Now it looks like we have to put the whole thing on hold." His neighbors were finding similar clues in other places. Unfamiliar trucks were lumbering across the Kickapoo Trail through the Big Morongo Canyon Preserve; helicopters were landing on the boundaries of birdwatchers' desert hideaways. The men who emerged from the trucks and helicopters cheerfully identified themselves as surveyors for the Los Angeles Department of Water and Power, and handed out fliers detailing plans for their brand-new renewable electricity transmission project, the Green Path North. In some circles, this was awfully good news. The LADWP had begun planning the Green Path North three years ago, in part to access carbon-free, always-on power from geothermal fields in the Imperial Valley near the Salton Sea, 180 miles away. The utility appeared to be moving ahead aggressively on renewable-energy transmission -- and that meant it might soon deliver on its long-stalled promise to bring green power to its 4 million customers, who currently rely on coal burned out of state for close to half their electricity. "The LADWP wants to be a leader in the field of renewable energy," affirmed the utility's new general manager and CEO, H. David Nahai, shortly after he moved from the utility's board of commissioners to its executive branch in December. And a significant piece of that effort, he said, will be "building the transmission to bring it home." But for Puglisi, who also volunteers with several desert conservancies, the markers signaled a new threat to a landscape that local environmentalists had long worked to preserve. Small nonprofits like The Wildlands Conservancy and the Mojave Desert Land Trust have spent years cobbling together private and public funds to buy up hundreds of thousands of acres of the Mojave, preserving them for marginal species like the fringe-toed lizard and the endangered peninsular bighorn sheep. If the survey markers indicated anything, it was that 85 miles of 160-foot-tall steel towers, occupying a footprint 330 feet wide and buzzing with 500 kilovolt wires, would soon be cutting across the path those sheep use to get to their only source of summer water. 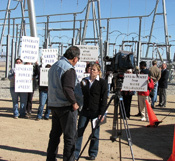 Worried calls to the utility invariably met with the same response: No route had been decided upon, and any discussion with the community over the transmission project would be premature. The utility confirms only that the Green Path North has to extend south from the desert town of Hesperia to a substation near Palm Springs, where it will link up with existing transmission to the Salton Sea and Arizona's Palo Verde nuclear plant. It could do that via any of six different routes, including one down the Interstate 10 freeway corridor, which would expand a right of way owned by another California utility, Southern California Edison, and require the condemnation of 3,500 properties.